Andy Mueller with the Sycamore Mandolin that he built using wood that I harvested . He was able to do even the neck with Sycamore . 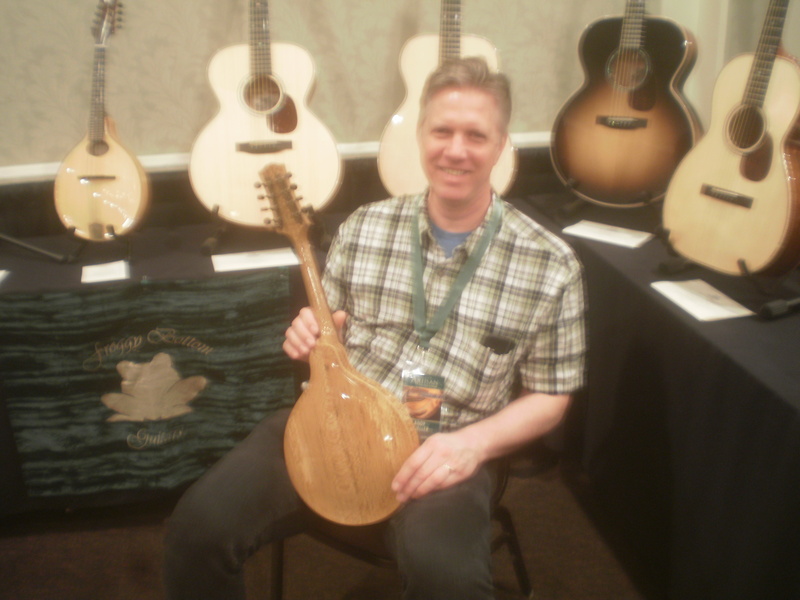 He brought it to the Artisan Guitar Show this weekend and I was fortunate enough to see and hear the results using a wood that I have not known of in a Mandolin . Muleskinner Mandolins is his brand and he does fine work . I just needed to plug Andy . I'm not a luthier, but I burn wood in my home for heating. I've cut and split a lot of maple and sycamore. They are similar in density and hardness and both burn great. But maple's grain is way easier to split. Splitting sycamore is like trying to split a Brillo pad . Sycamore burns great . Very little ash and what you do end up with is almost pure white . From what I heard , sycamore has great potential as a Mandolin wood . After all , European Sycamore is a Maple , so it seems like a natural match . Sure would love to see and hear an archtop built with it . This particular Sycamore had just a bit of spalting in it . Nothing that would affect structural integrity , but just a touch . Very strong medullary rays . There was a guy up here in Southcentral Alaska who built mandolins from locally sourced birch and spruce, and his mandolins sounded quite good. I’ve never heard of anyone building mandolins from sycamore, but more power to him. Andy is one of the builders at Froggy Bottom guitars. I’ve played some of his mandolins at the mandolin festival in Concord, NH. He’s a great musician, and I think that really brings a lot to the table.